Begonias add bright color to partially-shaded areas of the garden. These tender perennials provide colorful blooms to the yard all summer long. 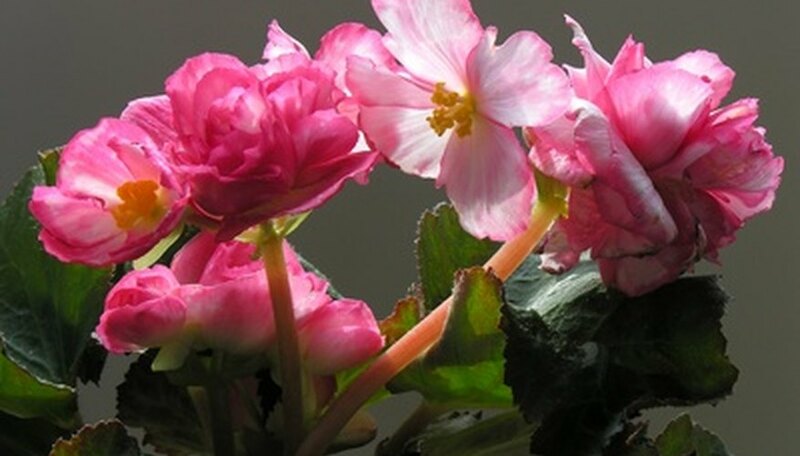 Because begonias are a tender perennial, they do not survive winter freezing. Dig up and store the begonia's tuberous roots to transplant back into your garden in early summer. You can also transplant begonia seedlings once all danger of frost has passed in spring. Set potted begonia seedlings outdoors one week prior to transplanting them to the garden. Place them in an area that is protected from direct sunlight and wind during the daytime and bring them back in at night. This helps adjust the plants to outdoor conditions so they don't suffer from transplant shock. Prepare the garden bed for transplanting. Choose a partially-shaded, well-drained bed. Lay a 2-inch layer of compost over the bed and till it into the top 10 inches of soil to add nutrients and drainage. Dig planting holes deep enough so that the begonia tubers are planted at the same depth they were at in their nursery pots. Generally, the top of the tuber sits about ½ inch beneath the soil's surface. Space the holes 8 to 12 inches apart in the bed. Grasp the begonia by the stem near the soil's surface and lift it out of the pot. Set it in the planting hole and adjust it until it sets at the proper depth. Fill in around the root system with soil then lightly firm the soil in place with your hands. Water the begonia until the soil feels evenly moist to a 6-inch depth when you stick your finger into it. Avoid getting water in the center of the begonia plant, as this can lead to rot. If you are planting dormant roots directly to the garden, make sure the indented side of the tuber faces up as this is the top where the buds are. Too much sun causes begonia leaves to wither and die.